Christmas Ornaments Made in USA - 2008 White House Benjamin Harrison Ornament - A Christmas Ornament Co. 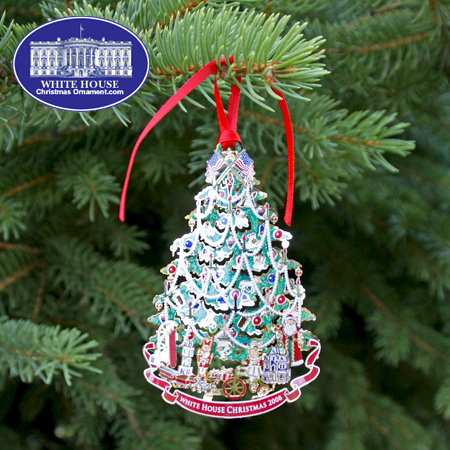 The White House Ornament Collection presents The 2008 White House Benjamin Harrison Ornament. The Christmas tree is full of white streams and garland while decorated with many gorgeous toys and treats. At the foot of the Christmas tree there are presents for all of President Harrison's grandchildren; Benjamin, Mary, and Marthena. Benjamin received a grand wooden sled and toy train while Mary found a tricycle and friendly doll. Marthena received her doll house while a giant Santa Claus completes the season's holiday cheer.